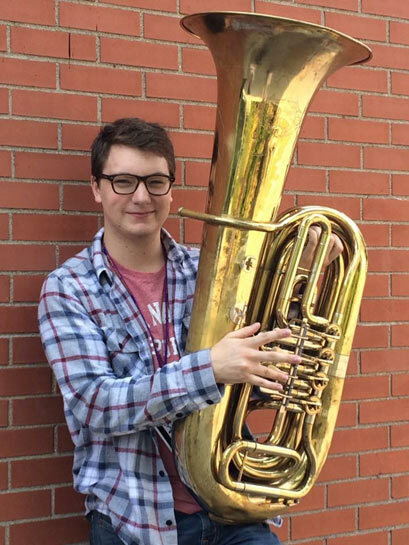 Liam began learning piano at age 9 and later focused on low brass instruments, including tuba. He was selected to attend OELC (Ontario Education & Leadership Camp for music) a program for students who have shown talent for not only music but also a potential for leadership. This influenced his decision to attend university with the intent of becoming a music teacher. Having been brought up with a strong sense of community has brought opportunities that have helped Liam grow as a musician. Volunteering at festivals, singing and playing in choirs and musicals and being part of the Cambridge Youth Symphony Orchestra are a few things that have helped to foster his performance confidence and enthusiasm, which is encouraged with Liam’s students.